In December 2009 Rutherford County (NC) finalized efforts to complete and execute a contract with the non-profit entity Pangaea concerning the county's 38 mile fiber-optic network. The contract, as of its December 21st version, gives Pangaea full ownership of the county's 38 mile fiber infrastructure. In return the county receives exclusive rights to use the fiber-optic (IRU) for the same 38 miles of fiber-optic network, while paying $60,000 per year to Pangaea for maintenance of the network. The county spent over $1 Million, received as grants, to build the fiber-optic infrastructure. The contract gives the entire network to Pangaea at no cost; see this section for details on the $10 sale. As the contract stands, the are several serious concerns listed in the Concerns sections that should be at the very least considered before executing the contract in its latest form. Pangaea is a non-profit organization based in Tryon, NC formally started in January of 2003 under the name e-Polk. The name Pangaea was adopted in 2007. Pangaea is mainly funded by grants and revenues from its customer-partners such as Polk and Rutherford Schools and County Governments and others. Since 2003 they have received over $2 Million in grants. platform of innovation for rural western North Carolina and upstate South Carolina. In 2007 Rutherford County received a $1.445 Million grant from the Golden LEAF's Community Assistance Initiative. The grant application was initiated by Foothills Connect, however the final result of the received funds is now in possession of Rutherford County, as the county is the owner of the 38 mile fiber-optic installation paid for by the grant. $300,000 of the $1.445 Million was used to connect several schools to an already existing fiber-optic network. The remaining $1.14 Million were used to build the new 38 mile network used by the county and its emergency services sites. The county currently owns two fiber-optic network segments. 62 miles used to interconnect the schools in the county. 38 miles used to interconnect the county operations, specifically the emergency services operations. This segment is the subject of the contract discussed on this page. The county paid for this 38 mile installation with the $1.445 Million Golden LEAF grant. This site doesn't discuss the above versions as they were made obsolete by the December 21st 2009 version, which is discussed in the following section. The version released for the December 21 2009 county commissioners' meeting is accessible at this link which is the agenda for the meeting. The county agrees to sell the physical fiber-optic cable to Pangaea for $10. The county will pay Pangaea $60,000 per year to maintain the fiber-optic network. Pangaea will cover the first $20,000 worth of repairs per year. Pangaea commits to keep the network operational 98.5% of the time. This translates to about 11 hours of downtime per month. For a somewhat detailed explanation of IRU click here. In essence an IRU is a way for a company/entity to have the full use of a particular telecommunications transport (like fiber-optic cable) without actually owning the physical cable. 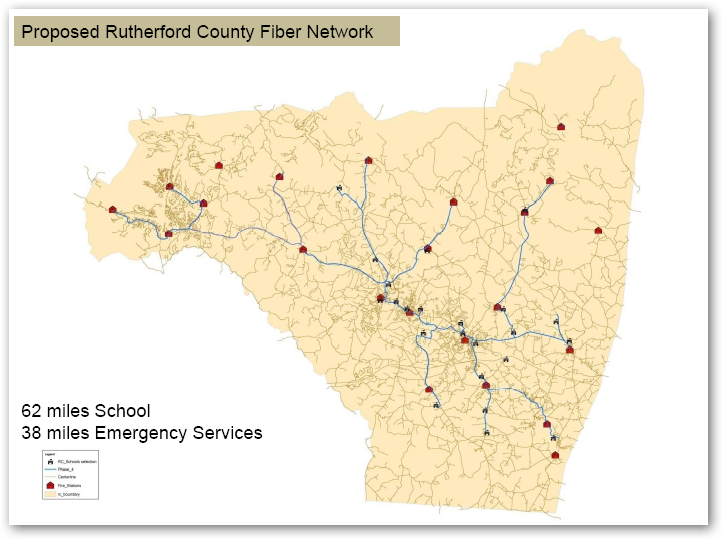 In Rutherford County's case, under the December 21st contract version, the county no longer would own the fiber-optic lines, however it would be the only user of the cable's capacity for data transmission. There seems to be a serious misunderstanding of the meaning of the IRU as evidenced by the discussion in the January 4th meeting. You can see the discussion if you skip to the 1 hour and 37 minute mark in the January 4th video. The discussion in the meeting identified IRUs to be the actual fibers inside the cable. With this understanding, it is easy to see how the current contract is viewed as not giving up anything to Pangaea. The correct meaning of IRUs crucial to understanding why this contract needs to be replaced by a simple lease or a maintenance agreement. The contract specifies that the county will sell the 38 mile fiber-optic infrastructure to Pangaea for the cost of $10. However, simultaneously, Pangaea will sell the county a 30 year IRU for $10. Thus making the transaction have a zero net effect on the county. You can see the details of this on Page 8 and 9 of the December 21st 2009 meeting agenda document. A new version was introduced at the January 4th commissioner's meeting, as part of the supplemental agenda made available on the day of the meeting. The changes in this contract were announced in the meeting during the presentation made by several key contributors to the Pangaea contract. You can view the contract at the above link and compare it with the December 21st version. Language used to describe the entities the County has the right to sub-lease their IRU to. The meeting discussion did mention that the language of the Pangaea contract was modeled according to the language of a Bankruptcy case tried in New York where the IRU was not lost due to the bankruptcy. The IRU was originally purchased for $575,000. The county is getting it for $10. The court ruling was specifically tied to this particular case, and did not make any general statements about IRUs in bankruptcy proceedings. Click here to watch the video if you can't see it on this page. The following are just a few specific points that stand out as problematic. The ideas in this section are a collection of conclusions arrived at by several individuals, some of which have extensive experience with telecommunications from operational, legal and financial areas. If you discover other concerns that you believe should be listed in this document, please contact us and share your ideas with us so that we may consider them for inclusion to this list. There is a legitimate concern as to what happens to the county's emergency operations in a scenario where Pangaea can not deliver on its commitments. The contract might list penalties for lack of service, however during that period where there is no service, the county's emergency services would be seriously degraded. There should be some sort of performance bond included in this contract to protect the county from extended downtime due to inadequate service. If for some reason Pangaea ends up in bankruptcy court, under this arrangement the fiber-optic network would be an asset that the court can decide to do with it as it wishes, so that the creditors are satisfied. Under this scenario, the IRU guarantee would be under a bankruptcy proceeding freeze, and the county can end up with no service on it's fiber-optic network for weeks if not months. Even after a final decision by the court, the new owner of the fiber-optic cable might not be required nor interested in offering the county the same service as Pangaea had. Given this scenario, turning over ownership of the fiber-optic infrastructure to Pangaea seems like a disaster waiting to happen to the county without any reasonable plan to handle the scenario. As an example, NC School Connectivity program is recommending to School Districts to not sign Internet Connectivity contract longer than one year. If the state takes over control of how local schools interconnect, then Pangaea might end up without any relevant income. While the county does retain the IRU on the network, the fact still remains that over $1 Million was spend to build up this infrastructure. There is nothing valuable that the county receives in return, as the ongoing service of the infrastructure is still being charged to the county in the amount of $60,000 per year plus any pole-attachment fees incurred. A more reasonable arrangement would simply keep the county the full owner of the fiber-optic infrastructure, while contracting an external party to maintain the network and guarantee continuous operation. If Pangaea is the best choice for this service contract, then they should be used. However, if others respond to a bid for this service to the county, then they should be considered as well. The 38 mile fiber-optic network cost over $1 Million to build. However, the current contract only requires that Pangaea share 10% of revenues it receives by signing up new customers on those same 38 miles. It would seem that the entity that paid for the infrastructure to be build ought to take in a percentage of revenues generated significantly larger than the 10% allowed in the contract. Typical arrangements like this one would be in the reverse, where the county would receive 70-80% of the revenue being that it is the owner of the fiber. Some similar concerns were raised by Golden LEAF as well in an email exchange between the county manager and an executive from the foundation. You can read the foundation's questions and the county's responses by clicking on this link. to the people of the County. The jump from "commercial" and "economic development" to "access to the people of the County" is a difficult one. needs that aren’t being met by the current providers. Another hard transition from "businesses and government/community entities" to "people of the County". In the January 4th Meeting an email from Golden LEAF which stated that the foundation had all their questions answered to their satisfaction, with the caveat that the decision whether the Pangaea contract is appropriate resting in the hands of the County and not with Golden LEAF. You can see the discussion regarding this update in the video of the meeting if you skip to the 1 hour and 34 minute time stamp. Many other lesser concerns exist in the documents, and I encourage you that you read them for yourselves, so that you may come to your own conclusions regarding this arrangement. The intent of this write-up is to simply capture your attention, so that then you would do the research for yourself. Once you do that, please contact the commissioners and share your opinions, ideas and concerns regarding this contract. You can find their contact information at this link. A document was published on the county web site containing, among other items, transcripts of meetings taking place over the last 2-3 years, where discussions regarding the handling of the county's fiber network were discussed. The document is accessible at this link. The Rutherford County web page containing documents and information on the PANGAEA contract. Davidson will need to raise taxes, cut expenses further, dip into its reserves or come up with some other way of raising the $2 million it needs to subsidize the MI-Connection communications system in the coming fiscal year. Manassas City,VA Council members voted unanimously Monday to end the city's role as a telecommunications provider... BPL costs the city $170,000 annually.